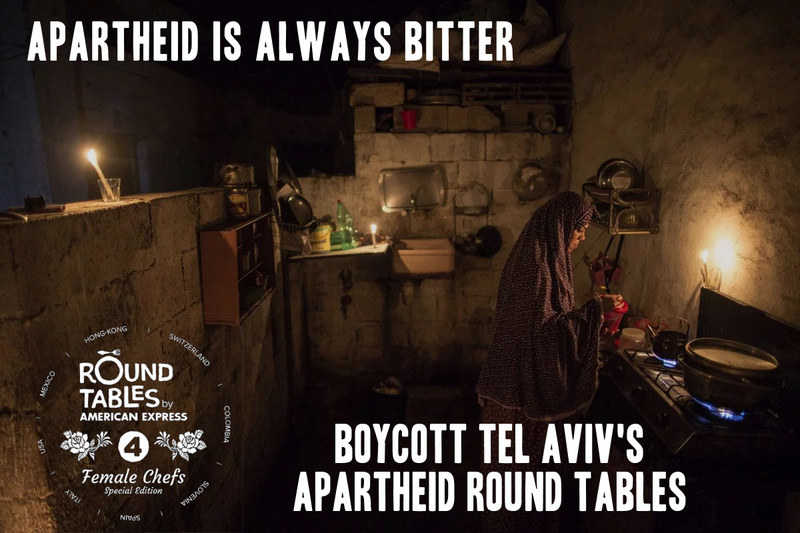 From Israeli citizens to international chefs: Cancel your participation at the Round Tables food festival in Israel! | BOYCOTT! We are Israeli citizens, opposed to our government’s policies of a belligerent military occupation, apartheid, and ethnic cleansing against the indigenous Palestinian people . We have learned of your upcoming participation in Israel’s Round Tables culinary festival and ask you to please cancel. Last year, Irish chef JP McMahon, top chef Mitsuharu Tsumurua and Bolivian chef Kamilla Seidler cancelled their participation in the festival, respecting the appeals from human rights defenders . Israel’s Ministry of Foreign affairs aims to market Israel as a “cool” and “cultured”- and most of all normal- country, in order to divert attention from its systematic and decades-long violations of the rights and lives of the indigenous Palestinian people . Round Tables- a Foreign Affairs Ministry supported event- describes itself as “a cultural project, an honorary member of the gastro-diplomacy movement which advocates cultural, economic and political dialogue through gastronomy, maintaining that the easiest way to win hearts and minds is through the stomach” . Unfortunately Israel’s objective with events such as Round Tables is to obscure political dialogue. Allow us to elaborate. Several months ago, in addition to over 65 laws that discriminate against Palestinians , Israel passed the “Nation State Law”, enshrining apartheid into its equivalent of a constitution . As we speak, Israel is committing an ongoing massacre against the people of Gaza, who are protesting the loss of their freedom and rights in a nonviolent way. Gaza is under a 12-year siege imposed by Israel, which makes them prisoners of the largest open-air prison in the world . Israel is a settler-colonial state, perpetrating the erasure of the indigenous Palestinian people, both physically and by means of appropriation of their culture, including indigenous food. One glaring example is Israel’s declaration of Falafel- a traditional Middle Eastern and Palestinian food- as the state’s “national dish” . In view of all this we ask you not to let Israel use your culinary creations and reputations to whitewash its crimes. We ask you to take a stand against the erasure of an indigenous people and cancel your participation at the Round Tables festival in Israel.